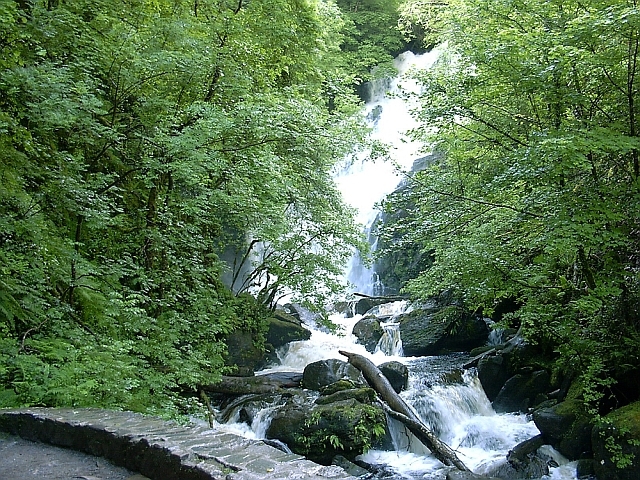 Torc Waterfall is approximately 7 kilometres from Killarney Town and approx 2.5 kilometres from the motor entrance to Muckross House and is signposted from a carpark off the N71. A short walk of approx 200 metres brings you to the waterfall. From that point steps lead to another viewing point at a higher altitude that provides a view over the Middle Lake. The path is also part of the Kerry Way long distance walking route and a starting point for circular walking routes which are indicated by a map down at the start of the trail beside the car park. The waterfall which is approximately 20 metres high is at its best after heavy rainfall. Across the road from the car park jaunting cars can be hired for a trip to Muckross House within the National Park.